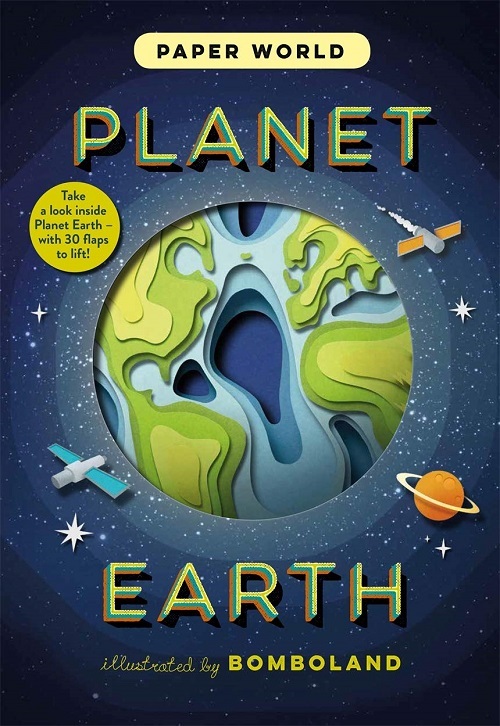 Following on from Earth Day on Monday, and my review of some Oceans books, I wanted to share a few more books that really shine with their content about Planet Earth. 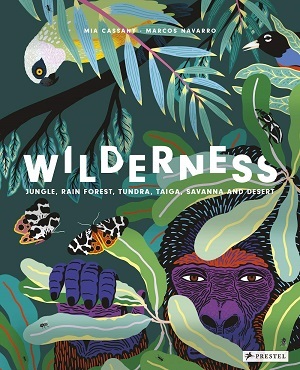 This oversize book showcases sixteen amazing habitats around the world from the Niokolo-Koba National Park in Senegal to the Qinling Mountains of China and beyond, and yet this is not scientific discovery so much as an impressive display of the effect achieved by digital artistry. Each page is an abundance of colour and pattern, and settles on a particular species native to that habitat. For example, Bengal tigers in Sundarbans National Park, geckos in the tropical rainforests of Madagascar. In this latter case, the illustration shows their intense brown and pink patterned bodies carefully camouflaged against similarly defined leaves – even the shapes fit together. On some spreads the animals are better hidden than others, leading the reader to seek and celebrate the creature within. Very scant text on each page gives a hint of the wildlife within and the beauty of the area. There is an emphasis on conservation and protection of species, and a world map to locate each habitat. Each page feels more exotic than the last with an intricate web of colour and pattern creating the flora and fauna – the Tehuacan-Cuicatlan Valley is a riot of colour and densely laid pattern so that the cactus plants feel as if they stretch back and back, giving depth and perspective. At the end of the book is a find out more section – intelligently showing each double page in miniature with the creatures labelled and identified, and showing how many creatures are depicted (you’ll be amazed at how many you missed first time round). There is factual content here too. An absorbing coffee-table-like book that will keep children enthralled and inspired as much by the artwork and design as by the creatures and information within. It’ll have them clamouring to visit far-flung places. You can buy it here. 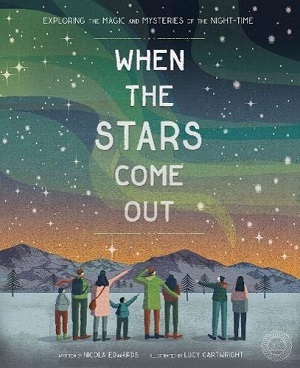 Ignotofsky’s distinctive style is highly recognisable from the very popular Women in Science book, but here she turns her attention to ecosystems. This is indeed an ‘incredible’ book in the level of detail of information provided, but also in the detail of the illustrations, diagrams, and presentation. 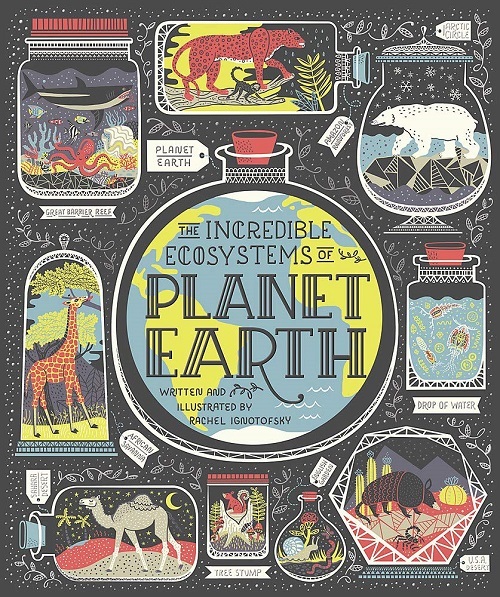 From the biome map in the beginning, with its bright coloured key and succinct explanation, to the graphic representation of the food web and flow of energy, in every diagram and illustration and every caption there is a wealth of information. This is comprehensive and yet incredibly readable. Teaching so much – for example, the importance of the edges of the ecosystem, to microscopic ecosystems, a great deal of information is covered in a short space, for the examples I have mentioned so far are just the beginning. The book then branches out into the different areas of the world, pinpointing particular parts such as the ecosystem of the Alps, a redwood forest, the Mojave Desert and much more. Aquatics are dealt with next, and then plants, carbon cycle (with a super illustration that not only informs but amuses with its distinctive personality), water cycle (check out the smiling clouds), and of course the impact of humans, positive and negative. In fact, this viewpoint informs most of the book – there is a slant in the text to the wonders of the natural world and humans’ responsibility to appreciate, protect and nurture, lending it a child-centric vision rather than purely scientific. The glossary is illustrated too – there isn’t a page that doesn’t amaze, result in further examination, or stimulate curiosity. Quite a feat. You can buy it here. Not always won over by clever gatefolds or pop-up designs as they can tend to be gimmicky, this book proves that used correctly, paper engineering can inform, inspire and dazzle. Looking through Earth to see its different layers in lift-up flaps, or feeling the slits and cut outs that show oceanic crusts and oceanic ridges, or pulling up a flap to reveal an underwater volcano, the clever cutting and shaping of the pages gives literal layers of depth and perspective to the biomes the authors wish to showcase. The newness of the book meant I had to run my hands along the pages to find the flaps, at the same time giving me a physical awareness of the lines of the book – cut out lines in the illustration that highlight the currents in the sea, the canyons in the mountains, the build up of cloud in a tornado. This is a shrewd design, teaching geography in a physical and tactile way. The text is clear and precise too. Short sharp sentences explaining layers and processes with ease. Detailing tectonic plates, glaciers, caves, deserts, weather and more. You can buy it here. 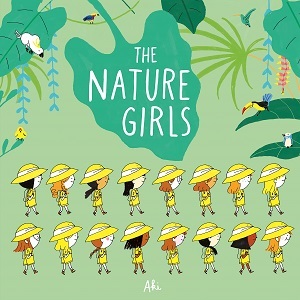 This phenomenally feminist and ultra modern exciting book portrays a group of girls exploring the world’s habitats, all in rhyming verse. Although a collective group in their yellow outfits and hats, each is different in the colour of their hair, skin, arrangement of body language or expression on their faces. They swim with dolphins, trek the land, ride camels across sand, explore woodland and traverse snowy tundra. The illustrations are unique and surprising, from the patterned mountains of ice to the exotic jungle and the colourful sea. For young readers who want to start learning about habitats, this is a bright beautiful picture book, with facts about the different biomes at the back. Perfect early learning. Of course to keep our planet as wonderful as the books above describe, we need to work a little harder at looking after it. 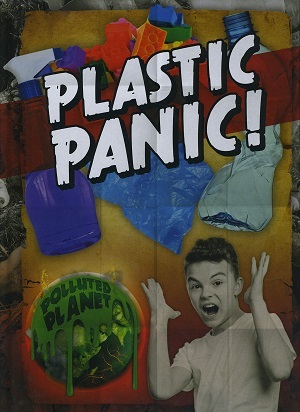 This up-to-date non-fiction book attempts to explain the explosion of plastic usage and why it’s dangerous to our planet. Each colourful spread uses a mixture of photos and diagrams to explore why the human race started using so much plastic, and when they realised it was a problem, before ultimately explaining what the reader can do about it. Starting with a message from the future, it carefully details the history of plastic – how great it seemed to start with – and then explains the level of toxins within plastic and its longevity. There are facts and figures – up to 2018, and a glossary at the back. Three informative double pages at the end talk through recycling, reusing and reducing, with community ideas and scientific solutions. An excellent tool for educating and responding. You can buy it here. Today is Earth Day. When we look at the Earth from space, it’s mainly blue. The oceans cover more than 70 per cent of our planet. Three sensational books take the reader up close and down into the depths of our fabulous oceans. Firstly, Oceans: Secrets of the Deep by Sabrina Weiss and Giulia De Amicis takes a comprehensive look at this largest habitat on Earth, from amazing creatures to the different zones in the sea: Twilight, Midnight, Hadal, the Abyss! And then it explores different ecosystems within, from kelp forests to coral reefs, before delving into surprising facts and creature information – the sounds of the ocean, journeys and migration, and lastly of course, how we can protect this marvellous environment. Filled with colourful, stark illustrations and infographics, printed on high-quality paper, the book exudes a sheen. Author Sabrina Weiss works for the British Ecological Society and the Marine Megafauna Foundation, and below she talks about her work protecting endangered ocean giants such as whale sharks and manta rays. How much do we really know about the ocean? Mornings in Praia do Tofo usually started with a cup of coffee on our veranda watching the waves lap on the shore. Hoping to escape the hectic city life for a while and donate our professional expertise to a good cause, Giulia De Amicis and I had found ourselves sharing a thatched house in this remote fishing village in southern Mozambique while volunteering for a charity that aims to study and protect threatened sharks and rays. We have long been lovers of the ocean and avid scuba divers, and so here we were, sipping our freshly-brewed coffees and recounting our incredible encounters from the day before. As we were hovering midwater during our final dive, I had pointed to three manta rays which were slowly approaching the reef below us. Mantas are often observed around the ‘cleaning stations’ on these bustling coral reefs, where they have their wounds tended by small fish. By doing this the mantas stay clean and healthy and the cleaners get a free meal. We couldn’t believe our luck. We had been reading and hearing lots about these elusive animals and had worked together on infographics and posters to share our love and fascination with the rest of the world and, yet, only now did we get to see them with our own eyes. These gentle giants, which can reach a ‘finspan’ of seven metres, are very curious and may even swim towards divers to inspect them before vanishing into the big blue. Even more astonishing is that no one has seen a manta ray give birth in the wild. Ever. It is thought that pregnant females may be seeking out pupping grounds along this beautiful coastline, possibly not far from Tofo. They may be giving birth right under our noses. 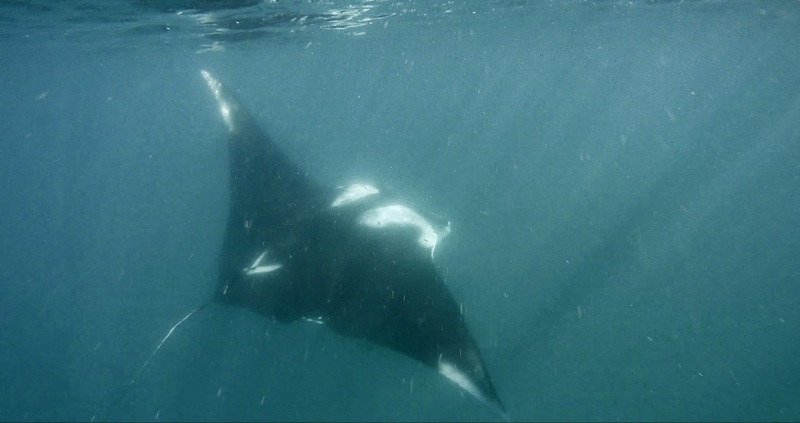 There is still so much to learn about the secret lives of mantas. Giulia returned to Milan the following day, but it wasn’t a final goodbye; it was the beginning of a new friendship and an exciting book project that allowed us to tell the fascinating stories of our beautiful and mysterious ocean-dwelling friends. With thanks to Sabrina Weiss. 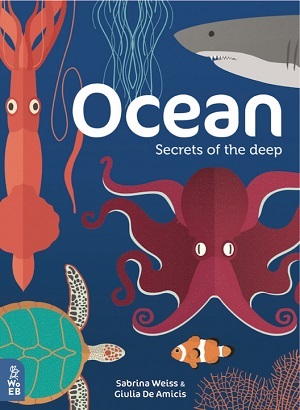 Ocean: Secrets of the Deep by Sabrina Weiss, illustrated by Giulia De Amicis is available now at £14.99, published by What on Earth Books, and you can buy it here. 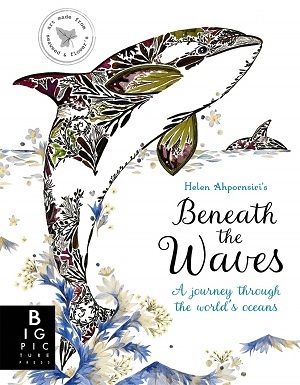 Other budding ocean enthusiasts and environmentalists will be keen to explore Helen Ahpornsiri’s Beneath the Waves: A Journey Through the World’s Oceans, text by Lily Murray. This book is something quite special – each of Ahpornsiri’s illustrations are made using real flora and foliage, which has been preserved using traditional flower pressing methods before she combines the individual pieces into a collage. The plants are organised by species or colour before being cut out and arranged to form the patterns and colours of plant life and the animals that dwell within. Much use is made of seaweed – fronds of purple laver creating the image of a whale shark, for example. The book is arranged into four distinct parts: coast, open ocean, tropics and polar waters, and each section explores the flora and fauna within, giving concise information. The illustrations are really quite extraordinary – the seahorse is rendered with a combination of tiny green flowers, light pink ferny leaves, and some darker pinkish brown flora to create an animated, almost fiery, expressive animal. A simple glossary at the back gives further information. This is a stunning book that holds a gentleness and will provoke a tender wonder at the natural world. 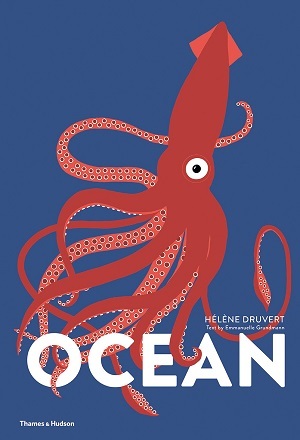 Ocean by Helene Druvert, text by Emmanuelle Grundmann also plays with the reader’s expectations, this time with paper-cuts. Using laser cuts and paper folding, the book has fun conveying information in a smart way with careful paper engineering. The depths of the oceans are shown using wavy paper cutting, the tide spread uses a large side flap to represent the tide coming in or out, the pebbles are flaps uncovering information on the sea floor, information about waves is given using a wave laser cut to look reminiscent of the famous illustration by Hokusai, the coral reef is stunningly colourful, and the food chain hidden beneath a super predator. This is a really tactile large-format reference book, with good basic information from the water cycle to the polar regions. Explore the depths here. Look out later this week for my Earth Day Earth books! It’s always exciting to discover a new illustrator, so I can imagine Boxer Books delight to find Fifi Kuo and commission four picture books from her straightaway. 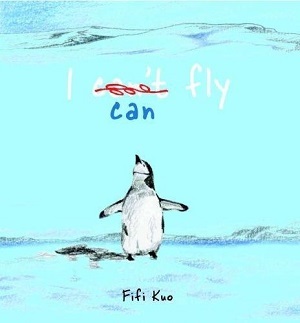 And it was no surprise to find that Kuo’s first picture book, I Can Fly, is longlisted for the Klaus Flugge Prize and shortlisted for the Read it Again! Picture Book Award and the Huckepack Picture Book Prize. 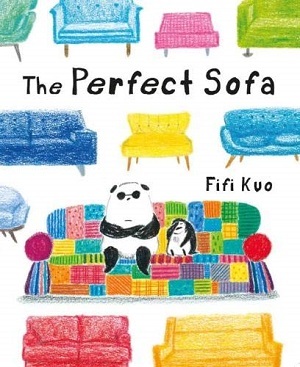 Kuo’s second book, The Perfect Sofa, dropped through my post box just as I was looking for a new sofa – and her message that we should be grateful for what we have – sometimes the perfect fit is right in front of us all the time – couldn’t be more spot on. 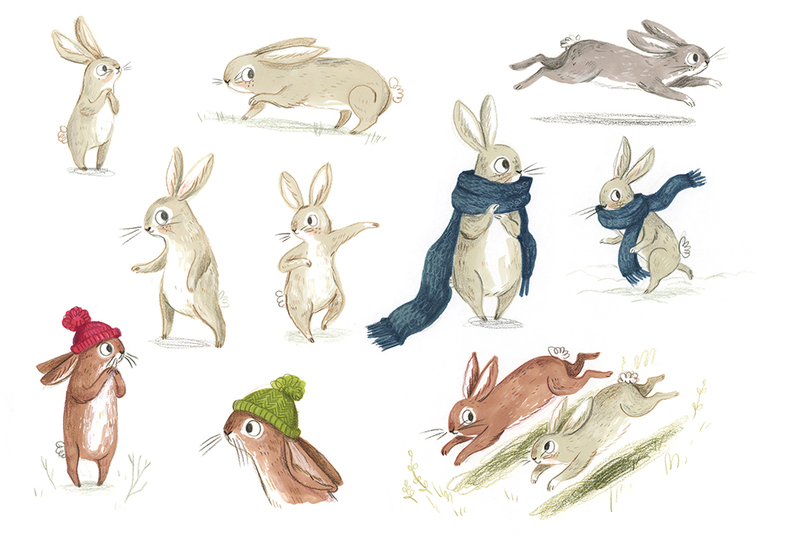 Smitten with Kuo’s expressive, spirited illustrations, and the neat messages behind her books, I was delighted to be able to ask Fifi some questions. And Fifi kindly answered in English for us, even though it isn’t her first language. The penguin features in both I Can Fly and The Perfect Sofa. 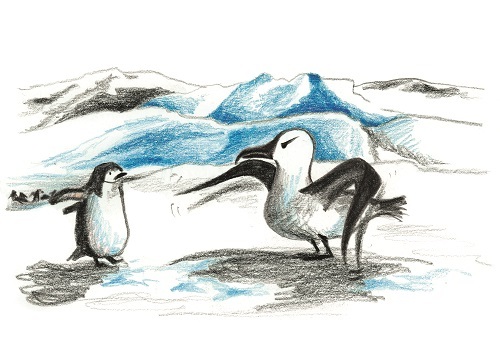 What is it about the penguin that makes it such a good animal to illustrate and use to express human emotions (anthropomorphism) in picture books? I believe that every creature in this world has their own emotions and feelings. So I don’t really consider giving an animal human feelings because I just see that an animal has feelings! I especially love to draw animals. When I’m drawing them I feel happy. When I was making ‘I Can Fly’, I realized that somehow, and I can’t explain why, drawing a penguin made me much happier than drawing other animals. I live in a tropical climate whilst penguins live in the South- Pole, somewhere I haven’t visited, so I have to imagine the extreme cold. I’ve loved penguins since I was a little child and this may be because they are different to birds in the way that they do not build a traditional nest and because they do not fly in the sky. After I created the penguin, I felt that she must be a bit lonely because she didn’t have a friend. I thought that as penguins and pandas are both black and white, they would look perfect together. Never mind about where they live! I like to think about what characters have in common and why they might attract and I suppose, without thinking, I decided on an Asian animal because I live in Taiwan. But when I am drawing I don’t really think about how to do something. I just fall in love with my characters and wish they had been my friends when I was little. I was an only child so often felt lonely. I am sure that children read pictures and sometimes drawings can express feelings better than words. Children can see how close Penguin and Panda are without me repeating their feelings in words. There is a strong element of humour in your picture books. Where do you think this comes from? Oh! I really appreciate that you said that because I don’t consider myself to be a humorous person but I do think humour is important. Sometimes I make serious points but without preaching. I think it is much better to be kind, gentle and funny. Children can learn things effortlessly and I would rather they relaxed and enjoyed the book. It might be that they pick up what my message is first time or they may get it later. For example, in The Perfect Sofa, the message is really to appreciate and value what you have. New is not always best and, of course, friends are important. But I hope children will enjoy discovering that themselves and have fun on the way. Do you own the perfect sofa? Nope, unfortunately, I don’t have my own perfect sofa. But fortunately, I can always look forward to it! I found out that I wanted a sofa when I got homesick after I had to move out from the campus accommodation when I was studying for my MA degree in Cambridge. 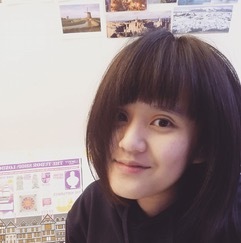 I found it really hard, as an international student, to find a place to live. During that time, I started to think about what makes me feel at home. Then I discovered I’m totally a sofa-person. I love to collect almost EVERYTHING … which often drives my parents crazy. These things also help me to feel at home. I collect labels, leaves, soft toys, candy papers, stamps, letters, cards … many, many things. Personally, I find it really hard to throw things away especially the things which bring back happy memories. It is funny how things can evoke memories. What message do you want children to take away from your picture books? My initial intention is to deliver the message of love. I believe there are many kinds of love. Many people love to go out shopping in a quest to find the perfect item or piece of clothing but what I think is important is shared experience and discovering that you can be happy when you are content with what you have and kind to other people. It is nice to look at familiar things with new eyes and to discover that new is not always best. Even better to have a friend by you when you make that journey. Sometimes life tells us that nothing is totally perfect but if we look we will find some tiny thing or person that could be perfect. All we need to do is to see it and cherish it. Sometimes you already have the perfect things! Which illustrators/children’s authors influence you? Raymond Briggs, Wolf Erlbruch and I feel passionate about Jimmy Liao (not just because he is also Taiwanese). I think he should be much better known in the UK. He is an absolute genius and shows us that picture books can be enjoyed on so many different levels and that they are for everyone. The artists also show us that children can understand difficult subjects, such as loss and death, which adults sometimes find difficult to discuss. Did you have a favourite book as a child? The Snowman. I still love it! I read it in Taiwan when I was very young and had never seen snow. I love the friendship between the boy and the snowman and the bird’s eye view of the world. Of course, it is a wordless picture book but I would still say that I read it and each time, I still find something new in Raymond Briggs’s fabulous pictures. You’ve said you like to draw trees and houses – what is it about these that attracts you? I studied Landscape Architecture in my BA degree, and that’s the thing I was most familiar with when I first learned ‘illustration’. When I studied illustration, I used to draw trees and houses because they were in my comfort zone. I’m the person who almost always lacks confidence. Even now, I still think I’m not a ‘good illustrator’, but I’ll always try my best to keep going and telling stories. I love what I do. I wouldn’t want to do anything else, but I still need to gain confidence. What was your reaction upon hearing your book deal? I couldn’t believe it. I was SO happy. One book is good – 4 is out of this world. David and Leilani at Boxer Books are so good to work with. They listen to my ideas and help me grow. I feel so lucky. It is like a dreamy journey. I am filled with thankfulness. 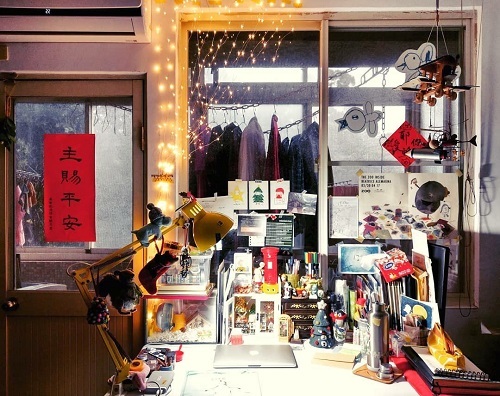 Can you give us an idea of your work desk/bench? Is it near a window? Do you have a special pen? A big table is definitely necessary. It’s near a window… I love the window! I love the light and the fact I can look out and day-dream. I love to recycle things to make homes for my colour-pencils. Better than buying plastic storage items! Usually, my working table is totally a mess. Sometimes I clean it up when the switch in my brain is accidentally turned on to clear-up mode! I don’t have any special pen, but I do have a few colours I always love to grab. I like to illustrate in different ways using pens, inks, collage … I love to experiment. And I will always continue to learn, to see things as if I am looking at them for the first time and to draw from the heart. With huge thanks to Fifi Kuo. 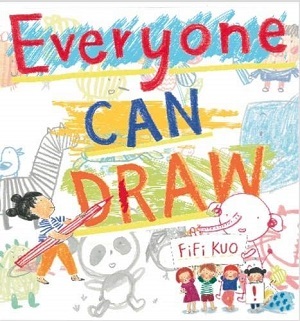 Each of Kuo’s picture books is unique, but equally each pulses with emotion and humour, and the drawings are gentle and endearing, fierce and funny. I highly recommend a look at both I Can Fly and The Perfect Sofa. You can buy I Can Fly here and The Perfect Sofa here. 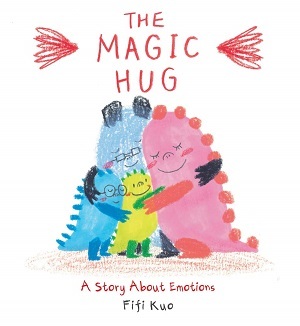 Everyone Can Draw and The Magic Hug: A Book about Emotions are published later this year. Anna Dupont inherits the now dilapidated, once sunniest hotel in town, which has a rival up the road, and is only populated by sad employees T Bear the doorman, and Mr Lemmy on the front desk. With a lot of hard work, careful ‘human’ resources, (including hiring a giraffe for handyman jobs, and a cleaner with a dust allergy), much kindness, and an emphasis on pulling together, Anna oversees the renovation of her hotel to once again become an exciting establishment. 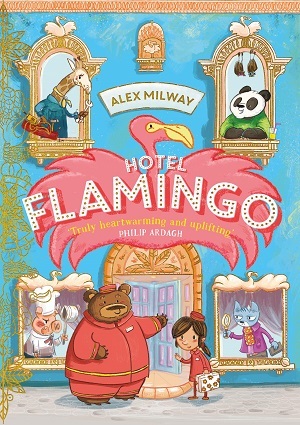 Bursting with enthusiasm, positivity, and magnificently warm illustrations, embracing the diversity of the guests, and adding much humour, this is a great place to stay for a while. First in a series, the second is published in June. You can buy it here. Everybody falls out with a friend at some time or another. 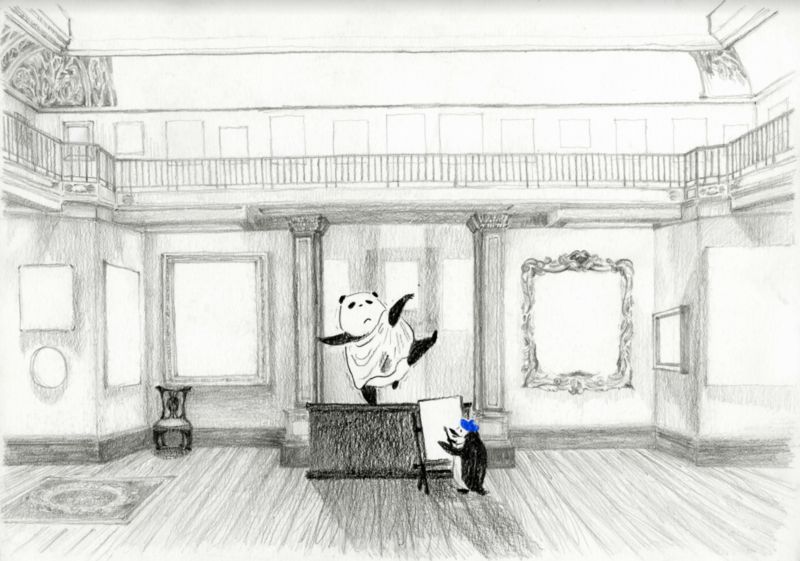 This delightful tale plays beautifully with the different perspectives of an argument. Lula and Lenka are best friends even though they are very different from one another. Until The Day Everything Goes Wrong. The book splits into dual narrative, each differentiated by a different typeface for extra emphasis, as each tells the story of their argument from their perspective. Insightful about the lonely consequences of arguing and not forgiving, and exploring the complementary attributes a friend might have. Thought-provoking and exploring how to look at something with another’s eyes – and it was all over a pencil case! If only Brexit were so easy to solve. Most magically though, the book is colour-illustrated throughout, bridging the gap between picture books and more sparsely illustrated black and white chapter books. You can buy it here. The author of two phenomenal picture books, I Really Want the Cake and You Must Bring a Hat, turns to wizardry for this chapter book outing. One of the more sparsely illustrated titles here, but still populated with a decent number of Dempsey’s expressive illustrations, this is the first in a series that looks set to be rather good. Fred is a Wizard, but sadly not a very good one – certainly not as good as his siblings or schoolmates. When his siblings, and his parents expect him to fail in everything, Fred decides to prove them all wrong and finally make them proud in a Wizard competition. 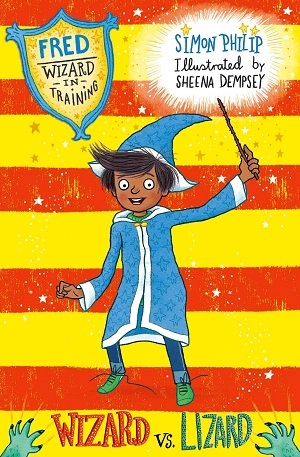 With great humour and an overload of the everyday – Fred the Wizard may have a wand, but also a bus pass and a library card (which come in rather handy), this is a loveable introduction to chapter books. With messages on bravery, determination, and how using quick-thinking and inspiration can cast just as many spells as being a wizard. Oh, and never under-estimating yourself! Buy yours here. More witchiness in this two-tone (purple and black) illustrated first chapter book. 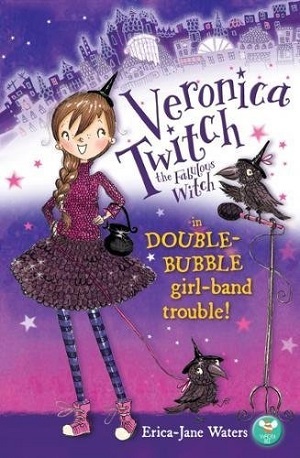 Veronica is a witch journalist, Editor-in-Chief at Twitch Magazine, and due to write a feature on the band Double-Bubble. But when the band is kidnapped, Veronica has to use her investigative skills to dig deeper. Could Belinda Bullfrog from rival magazine, Nosy Toad, be behind the band’s disappearance? With Witch City full of fun place-names such as Grand Central Broom Station, and accessories including hand-cauldrons instead of handbags, and frosted bataccinos to drink, this is a fully imagined other world, with trendy and stylish characters (each given a page profile at the start). It’s fun and fast, and slick as a tube of lip gloss. Have a witchy time here. An even lighter read in this splendid tale of what happens when the animals are in charge of the pirate ship. Patch the Cat, Monty the Monkey, and Cutlass the Parrot accompany Captain Halibut and his crew on their dastardly pirate adventures, but sometimes the animals steer the way as their pirate owners can be a little hapless. 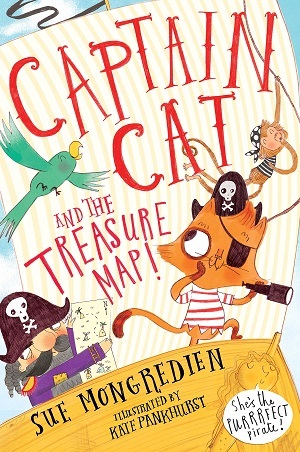 When a treasure map is found, the pirates look set to cash in, but the animals sense danger. Can they save their pirate crew? Chaos and mayhem in the plot are cunningly drawn by Pankhurst, illustrations litter the text. A fast plot, lots of terribly punning, and a brilliant message that being the quiet one who no one listens to doesn’t mean that you don’t have the best ideas! Underappreciated Patch is a new favourite character. Yo ho ho, and you can buy one here. More piracy in this newest adventure from an old pug on the block. This is the fourth Pug book from Laura James, which tells the tale of our role-playing pug and his friend Lady Miranda. 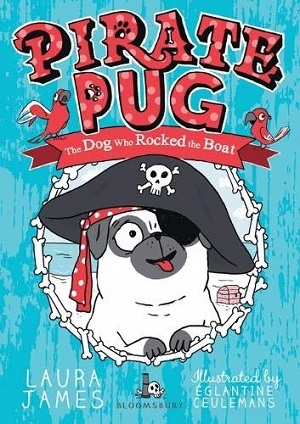 With large text and lots of illustrations, Pug inadvertently becomes a pirate when he suffers an eye injury and has to wear a patch. There’s more buried treasure here, a spot marked with an X, and unfortunately, a pug who can’t swim. Ceulemans has conjured a special world for Lady Miranda and Pug, an everyday familiarity laced with aristocracy, which makes for great fun in reading and looking at the books in detail. See a pirate here. 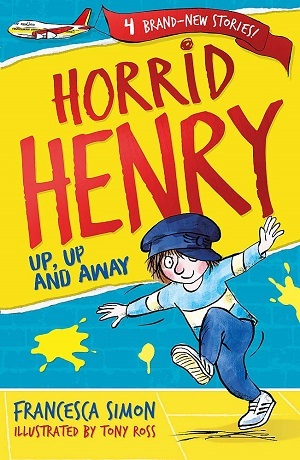 Where would any young fiction collection be without Horrid Henry? To celebrate 25 years of the cheeky chap, Francesca Simon has penned four more stories, nicely packaged in this red-foil-covered collection, called Horrid Henry Up, Up and Away, illustrated by Tony Ross. 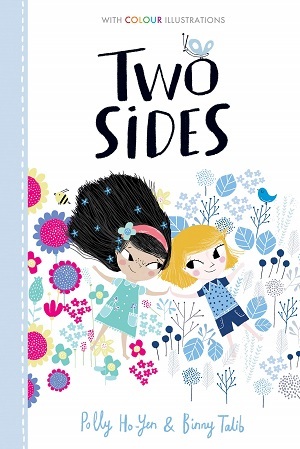 Taking cues from the likes of Pamela Butchart, the text is now punctuated with a mass of jazzed up fonts, big and small for emphasis, but the same old Henry is in there, with his delightful sibling Perfect Peter. Never normally one to agree with awarding certificates simply for taking part, this book may have changed my mind. 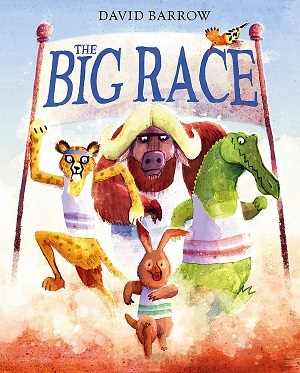 Aardvark is small and doesn’t have the skillset of the other animals, the crocodile, cheetah, buffalo and African hoopoe, taking part in the race. And stamina, strength and speed are required in this ‘great race’, which involves running, cycling, diving off a waterfall, swimming, tightrope walking, rope swinging and parachuting from a hot air balloon – all in the natural African landscape. Aardvark doesn’t give up, showing resilience all the way through – battling on her scooter against the other animals’ bikes, using armbands to swim underwater – never succumbing to her tiredness and misfortune. She’s the only one whose parachute goes awry, for example. And she shows immense pleasure at her medal – simply being rewarded for taking part (as she should, this is one tough race!). Barrow’s illustrations throughout are a delight. 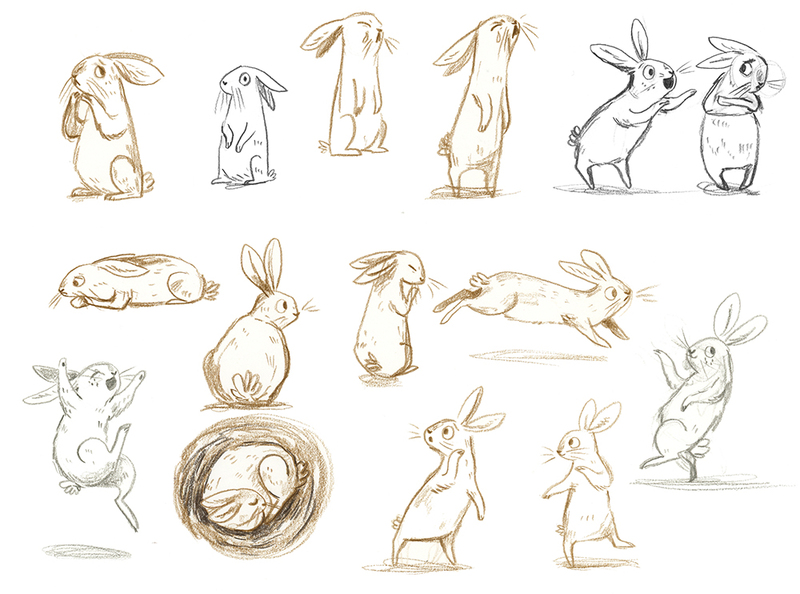 Any animal race will be reminiscent of The Hare and the Tortoise, but Barrow’s vision is modern and fresh, with relentless movement and humour in the pictures. You can buy it here. This playful, happy book also features a group of animals, this time as friends, a monkey, a tortoise and an anteater, playing in their natural habitat, splashing in rivers, making up monsters, doing silly dancing. They are a little intimidated to play with Little Crocodile though, with his many teeth and sharp claws. The naughty Crocodile mother (and adult readers will laugh inwardly here) suggests a game of ‘Kiss the Crocodile’, a sort of daring game. 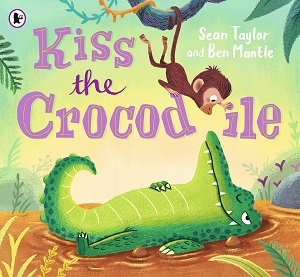 This is, in essence, a simple and oft-repeated message about letting everyone join in, but the illustrations are so impossibly endearing, the monkey so impish, the crocodile so self-assured, that it makes reading an absolute pleasure. Even more pleasure if you read it aloud (with its repetition and suspense). Well executed and great fun. Kissable. You can buy it here. Looking for something more ferocious than a crocodile – how about a dinosaur? The pictures tell the reader that Eliza Jane (a human girl) is obsessed with dinosaurs, from dressing up as one, to the shape of her cuddly toy, to the pictures adorning her walls. 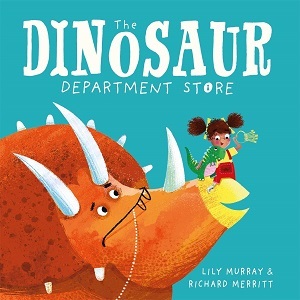 So when, rather delightfully, she tells her parents that now she is four she wants a real dinosaur (rhyming is throughout), there is only one place to visit – the dinosaur department store. Here, with flourish and eccentricity, the department store owner shows Eliza Jane all the different types of dinosaurs, only to be annoyed that his time has been wasted when she declares at the end that she no longer wants a dinosaur pet. Why not? The clues have been in the pictures all along. 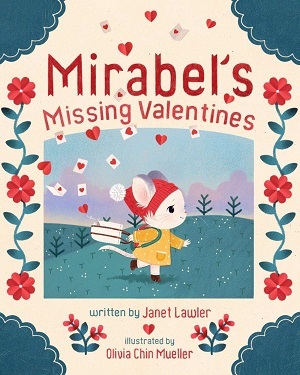 An excellent rhyming picture book that’s vibrant, exuberant and fun, with pictures telling the other half of the story. Highly recommend. You can buy it here. More fun and frolics and rhymes in this jumping book about frogs. Tommy brings his box of frogs into school, and unfortunately for the staff, they don’t remain in the box for long. Calvert has great fun exploring the different places around the school that the frogs might inhabit (including the Headteacher’s hair), and also ways in which Tommy might capture them again. 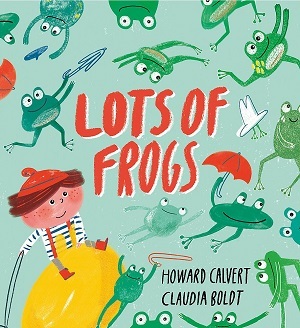 What’s more Calvert, and illustrator Boldt, imbue the frogs with lots of personality – they are as cheeky as monkeys. Lots to admire here – the frogs almost seem to be like schoolchildren themselves – very human, and Calvert introduces numbers, eating habits and so on. One slightly dodgy rhyme, but on the whole a great fun read that will have the class clamouring to bring in their own pets. Or certainly to be read the story again. You can buy it here. Anthropomorphic foxes in this sympathetic look at how children and parents view the concept of time differently. Reminiscent of some of the Jill Murphy picture books, this representation of a sprightly family and their everyday lives is both wise and heartwarming. 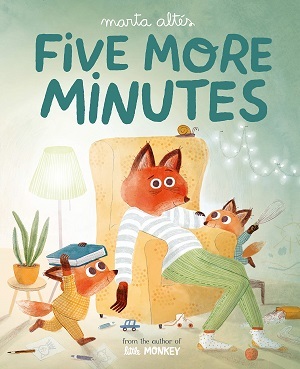 Five more minutes means something very different for the child or adult as they view the various moments in their lives. For Dad (the primary caregiver), five more minutes at a children’s party feels long whereas five more minutes in bed feels short. On the way to school, fox is doubtful of his father’s protestations that there is no time – they need to hurry – but the young fox makes time for jumping in puddles, watching the birds and more. Conversely, for the young fox, waiting for a cake to bake takes ages: there is too much time. The illustrations are kind and forgiving, the Dad always attentive and loving, the house ordinary and familiar, the expressions well-articulated. Take a particular look at the little foxes’ faces when eating the cupcakes. Some things are worth waiting for. Pre-order your picture book here now. Meserve has a way with illustration. Her child characters are hugely differentiated, personalities zinging from the page, and she holds an astounding attention to detail – the shoelaces of the children like little wings, the crafting of the teacher, Mr Biggity, as condescending, before the reader has even read a word. Is it his long nose, his large nostril, the upturn of his toe, his hand positioning, the way his eye glances back at the children. He’s going to be tricky. And thus it proves, on an outing to a wildlife park, Mr Biggity dismisses the animals as being vastly inferior, when Clara, with the red coat, notices that animals are rather good at communicating and feeling. 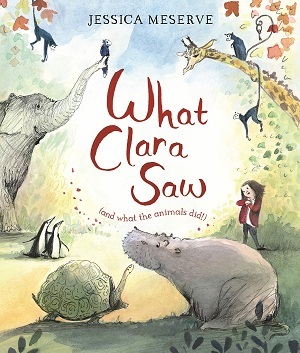 The reader will notice how observant Clara is, and if they too are observant, they’ll witness a whole other story just by ‘reading the pictures’ rather than listening to the text. A book that encourages thought and debate about how much animals feel, and perhaps even about how much we should stand up for what we believe to be true rather than being mindlessly fed false information. Exquisite illustrations. You can buy it here. A simpler message in this animal book about not judging someone from the way they look. Rhino Neil is huge and the other animals stay away from him. After all, he has a huge horn that might spike, fearsome feet that trample, and a tremendous tummy that can fit lots in it, as well as a big bottom that could squash everyone. 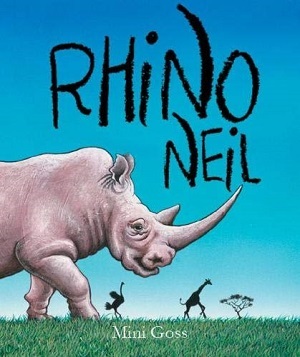 When an even bigger animal arrives by truck, the animals are all scared – except for Rhino Neil, who accepts the new elephant as his friend – and sometimes even feels small next to him. It’s not fully explained where the animals are – a wildlife park perhaps – and it’s a shame that all the animals aren’t accepting and make friends with the rhino and elephant at the end, despite their size, but this is an interesting take on the idea of size and may entertain some. Bright images and close-ups of body parts. You can buy it here. 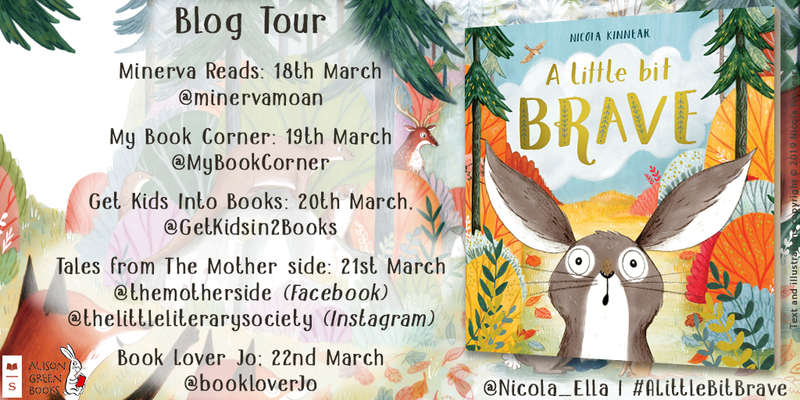 From the moment I set eyes on Logan, the stay-at-home bunny who features in A Little Bit Brave by Nicola Kinnear, I rather fell for him. Logan is first seen sitting comfortably and knitting, a steaming mug nearby, alongside a bookcase almost as packed as mine. He is listening, rapt, to the daring adventures of his companion Luna – herself mid-leap, wooden spoon thrust as if it were a sword, as she acts out her latest adventure with passion and zest. All of Kinnear’s drawings are equally immersive in this book about plucking up the courage to have adventures. Logan does eventually venture outside, away from his knitting, and tries to join Luna in her adventures, but the world outside can hold danger, and in the end he might have to face up to it alone – albeit to save his friend. There’s a great camaraderie between Logan and Luna, which takes a simple but effective look at wanting to please a friend and sticking up for them, but also how enormous courage surfaces when confronting dangers. Kinnear effectively explores the colours and sights of the natural world in her imagined woodland, giving the animals enough anthropomorphic features to render the scenarios and behaviours familiar to a young child. A Little Bit Brave by Nicola Kinnear (Scholastic) is available now. You can buy a copy here. It’s a glorious new picture book, perfect for scared little ones, or those being brave and confronting adventures. Towards the beginning of Storm Hound by Claire Fayers, the powerful(ish) protagonist, Storm of Odin, (a dog somewhat fallen from grace) is confronted by a flock of sheep, who rather hilariously, mock his seemingly inflated ego. and they fall about laughing. Sheep and cats and dogs play a large comic role in Fayer’s new humorous magical and mythological book about identity and companionship. 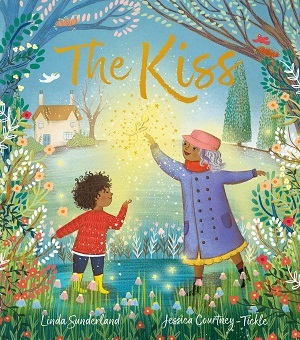 This storming novel, for readers aged 8 and over, is about learning where we fit in, and how home can be anywhere, as long we’re rooted within ourselves. Storm of Odin is the youngest hound of Odin’s Wild Hunt in the mythological skies. But on his first hunt, he gets lost, falling to earth from the Otherworld and ending up on the A40 about 5 miles from Abergavenny, near a flock of sheep. And in falling, he seems to have transformed from powerful horse-sized hunting dog to loveable cute little puppy. In time, he’s adopted by 12-year-old Jessica, a girl who also feels that her real home doesn’t lie in Abergavenny. Together, facing a magical world that they don’t quite understand, they slowly learn who to trust, and they form a strong bond that enables them to overcome the fiercest of challenges. Fayers throws a myriad of hilarious creatures into her novel, with cats and dogs and sheep given not only a voice but also comic interior monologues, incorporating extra depth to an ordinary Abergavenny day. Hey! Sheep! the stormhound shouted. The sheep gazed blankly at him, chewing grass. Eventually, one of them wandered closer. You talking to us? Wales has a lot of sheep: just under 10 million at the last count, so it won’t surprise anyone that a book set in Wales is going to feature sheep. They form a woolly Greek chorus, standing about the hillsides, watching and commenting on the action, and occasionally leaping out of bushes at people, like the velociraptors in Jurassic Park. Writing Storm Hound, I learned a few things about sheep that surprised me. (Disclaimer: these things may not necessarily be true). They have a really bad sense of humour, and make the most atrocious puns. Storm finds that out straight away. They always seem to know more about the world than they’re letting on, and they can give quite good advice sometimes if you know how to ask them. One thing I had to cut from the book, however, was the secret link between sheep and fate. There wasn’t quite space to include it, and it’s a bit of a side-step out of Norse and Welsh mythology and into Greek. According to Greek legend, Fate takes the form of three women: Clotho, Lachesis and Atropis. 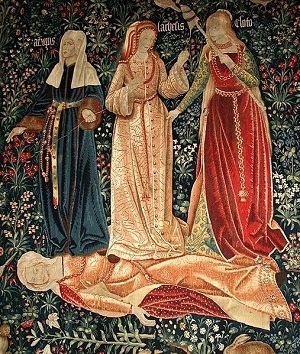 Clotho spins the thread of human fate, Lachesis measures it and Atropos cuts it. The Fates also appear in Roman myth, where they are called Nona, Decuma and Morta. They are often depicted as old women, inflexible and implacable. You cannot, after all negotiate with fate. What has this got to do with sheep, I hear you ask. Well, the Fates spin and measure and cut the thread of life, but what do you think that thread is made of? My money is on wool. It’s as likely as anything else and, in fact, it makes a lot of sense. Sheep are raised all over the world. They stand about in fields and on hills, staring at anyone who happens by. Watching and waiting. Because life is interesting and someone has to pay attention to what’s going on. Next time you see a field of sheep, don’t try to engage them in conversation. They’re not allowed to talk to humans, and if they did you’d get tangled up in woolly puns before you knew it. Just give them a wave and say hello. It always pays to be polite to Fate. A sheep’s wool never stops growing. One pound of sheep’s wool can make up to 10 miles of yarn. Sheep can recognise up to 50 other sheep faces. AND they can recognise human faces. The world’s most expensive sheep sold for £231,000 at a sale in Lanark, Scotland. Sheep feel emotions and prefer smiling human faces to angry ones. It is estimated that there are over 1,000 different breeds of sheep worldwide. A lamb can walk within minutes of being born. With thanks to Claire Fayers for this guest post about sheep! 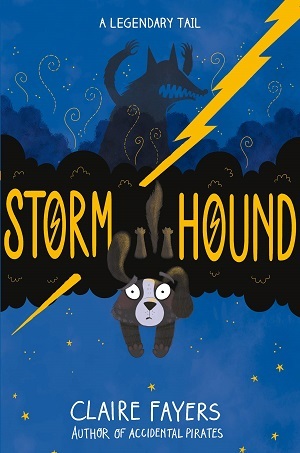 To buy Storm Hound, click here. I don’t have a pet, which means we often play a hypothetical game: if you had to choose, which would you be – a dog family or a cat family? This is another cracking read from a premier storyteller of our time. Eleven-year-old Georgie befriends an eccentric scientist hiding beneath an old entertainment centre, and becomes a guinea pig in her virtual reality 3D future. 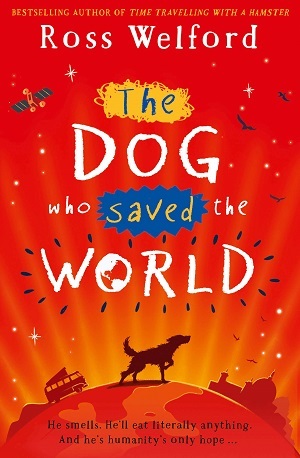 But when a deadly disease threatens the life of all dogs, and Georgie’s own dog gets sick, it’s a race to find a cure – a cure which most probably lies in the future. Welford’s writing is always clever and engaging, rattling through his plots with pace, humour and pathos, and it’s the kind of book you want to devour in one gulp. But to fully appreciate its modern sensibility and its heft as a meaty children’s book, it’s the little details that, when put together, make this an absolute belter of a book. Georgie’s friend is a refugee from ‘Nowhere-stan’ as he calls it himself, a country so decimated and of such little interest to the people here. But he’s an upbeat boy, with a raft of funny lines, a fully developed character who’s a great friend. The eccentric doctor is a social media billionaire technologist in hiding, who makes wonderful wisecracks about kids today; even the bit-part owner of the corner shop is named Norman Twokids by the kids for his ‘no more than two children at a time’ policy. 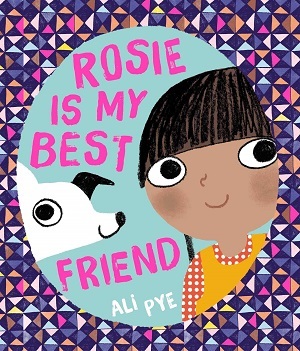 Add to this the moments of sweetness and empathy – the relationship between Georgie and her teen big brother, the small satisfaction that comes from a dog wagging its tail as it greets you – this is a slick, brilliant novel and even if dogs aren’t your thing, you’d be mad to miss it. For ages 9+ years. You can buy it here. When I was little I had to learn the poem Cats Sleep Anywhere by Eleanor Farjeon, and recite it in front of an audience. I still remember the first line, and it leads into a rhythmic romp through the places cats inhabit. I think if I had closed my eyes and imagined the illustrations, they would have looked like something out of Collecting Cats, a humorous riot of cat personalities. The anonymous narrator wants to collect cats, and starts with cheese. Cheese leads to mice, which leads to cats. And unfortunately for the narrator, then big cats. As well as a clowder of cats in a vast array of different colours and personalities, there is also a quirky collection of grabby mice. Scobie’s text is simple and logical with just the right amount of toned down humour, and her illustrations are flush with character, story and insight. 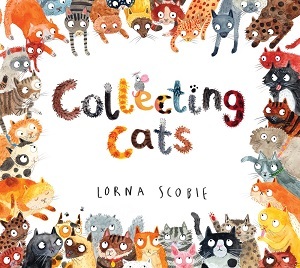 For cat collectors, or picture book collectors, or simply readers. You can buy it here. An exemplary first experience book in the Lulu series, which showcases the responsibility involved in owning a pet. 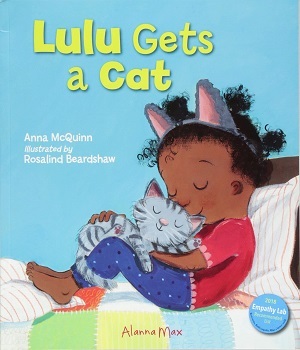 Lulu’s appeal is not only that her adventures are embedded in the family core, but books about her also highlight those things that are important in small lives. The visit to a library to find out more, a tick list at home giving her life structure and order, a loving and caring relationship with her parents, and a grounding in real life. One or two simple sentences per page, with the main focus being on the colourful illustrations of familiar situations – sitting on a parent’s lap looking at a laptop together, everyday dressing up for the fun of it, helping with shopping, and feeling secure in one’s bedroom. This particular episode in Lulu’s life points up the preparation needed before getting a cat, and its slow integration into the family. Wonderful. You can buy it here. 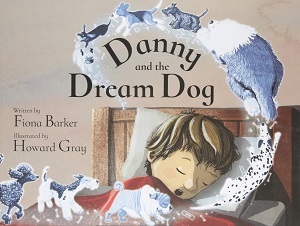 Danny’s mother isn’t as easily persuaded as Lulu’s, and Danny’s only dog is a dream dog. That is, until a new neighbour moves in next door who needs help with walking her dog. This seems like a perfect solution until Danny starts walking Maximus and realises that it isn’t as wonderful as he thought it’d be. Especially when it rains, or Maximus pulls on the leash and wants to chase rabbits. Before long though, Danny comes to see that it’s the community he embraces whilst walking Maximus that makes it a dream job, and the cosy chats with his new elderly neighbour afterwards. In essence, of course, this is a picture book about friendship, being community minded, and neighbourliness. The illustrations are warm and wholesome, creating whole immersive scenes on almost every spread – tea with the neighbour shows her life through a series of family photographs on the wall behind, scenes in the park demonstrate the diversity of the people there and the things they do. There are also many elements of humour wrapped into the book – squirrels threatened by the dogs, dog-shaped slippers. It’s a little dream of a picture book. You can buy it here. 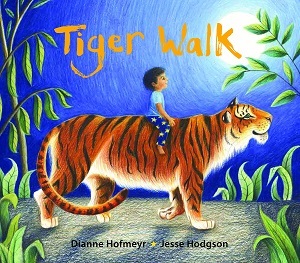 There are no domestic pets in this art-inspired picture book, but a tiger who oscillates between tame and wild in order to rid the young boy, Tom, of his fears. Tom visits an art gallery and sees the painting Surprised! by Rosseau. At home, he tries to copy the picture, and at night the tiger springs from the picture, and carrying Tom on its back, takes him on adventures through the jungle. It’s a neat conceit, in that every time the tiger suggests what to do next, Tom is scared – of swimming, of the cold, of the dark, of beasts. The tiger reassures him, and in the end Tom realises that of course he isn’t scared – he’s ridden a fearsome beast all through the night. Brought to dramatic life by sumptuous illustrations that seem to have burst from the Rousseau painting, the colours are bold and expressive, not only traversing between fear and curiosity, wild and tame, but also real and dreamlike. This is a clever picture book with sumptuous text that bears out the artistry in the illustrations too – moonlight shines, icicles crackle, tigers have swishing tails and flashing eyes. Aglow with natural beauty, this tiger comes close to winning a top spot in the heart, even if this one doesn’t come into the kitchen and devour all the tea. You can buy it here.